Far Cry New Dawn is poised to release next month, but before it can release into the wilds, the folk over at the Entertainment Software Rating Board (ESRB, the people who rate games in North America) have taken the open-world, post-apocalyptic first-person shooter for a test trial in order to deduce what type of rating it should be given. So, what does the ESRB think of the new Far Cry spin-off from Ubisoft? Well, like previous games in the series, Far Cry New Dawn has been awarded a "M" for "Mature" rating that broadly warns blood, intense violence, mild sexual themes, strong language, and the usage of alchol. Further, it notes of in-app purchases -- likely microtransactions in this case -- and user-interaction. The ESRB also provides the following "rating summary" of the game, which notably notes of speed b*ners, shotgun executions, and pornographic VHS tapes. "This is an action/adventure first-person shooter in which players assume the role of a captain of a security detail sent to rescue settlers. Set in a post-nuclear Montana, the game allows players to explore open-world environments, engage in combat missions, rescue hostages, and liberate outposts from enemy bandits/marauders. Players use machine guns, rifles, flamethrowers, and explosives to kill enemies in frenetic combat; combat is highlighted by realistic gunfire, large explosions, and blood-splatter effects. Stealth attacks (e.g., knife stabbing from behind) are also used to take out unsuspecting enemies discreetly. Cutscenes depict additional acts of intense violence: a man executed with a shotgun blast; a man shot point-blank in the chest. The game contains brief sexual references in the dialogue (e.g., “Party liquor, pornographic VHS tapes…cool guns”; “I wanna get a speed b*ner”; and “…[M]y heart is poundin' and my d*ck is hard.”). During the course of the game, players' character can consume alcohol, resulting in a screen-blurring effect and the character passing out. The words “f**k” and “sh*t” are heard in dialogue." Sounds like Far Cry, alright. The Ubisoft games aren't the most M-rated series around, but they do certainly dabble in all the content that would earn a M-rating in every rating region. 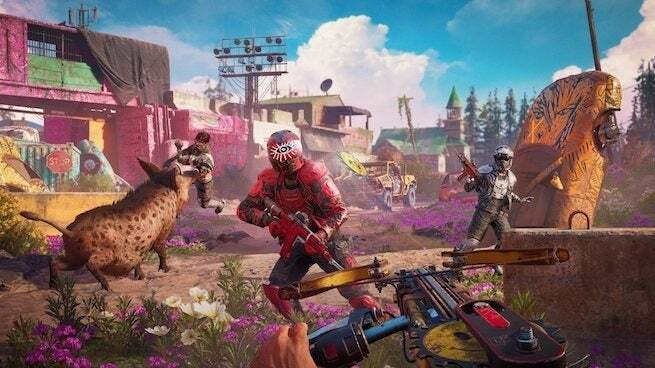 Far Cry New Dawn is poised to release on February 15 via the PS4, Xbox One, and PC. At the moment, there's been no word of a Nintendo Switch port. For more news and coverage on the game, click here.